Southern California home prices are expected to rise at about the same pace as California: 4.2 percent, according to the California Association of Realtors. That would put next November’s median price of an existing house at about $525,000. Los Angeles County home prices will rise 3.1 percent, according to Metrostudy. UC Riverside’s Center for Economic Forecasting and Development has a more optimistic forecast, predicting gains of 5 percent to 10 percent. CAR reported L.A. County house prices up 9 percent in the year ending in November. Orange County home prices are projected to rise 5 percent to 6 percent, according to forecasts by Chapman University and Cal State Fullerton. Metrostudy, a market intelligence and research firm, foresees a 3.2 percent gain in Orange County home prices. By comparison, Orange County house prices were up 6.9 percent in the year ending in November, according to CAR. Inland Empire home prices will rise 3.9 percent, Metrostudy predicted. UC Riverside forecast a price gain of 8.9 percent in Riverside County and 7.3 percent in San Bernardino County, with prices possibly getting back to record levels set before the 2007 housing crash. By comparison, Riverside County prices rose 8.7 percent in the year ending in November, and San Bernardino County prices rose 12 percent. Home price gains will continue in the year ahead, just not as fast as in 2017, economists said. 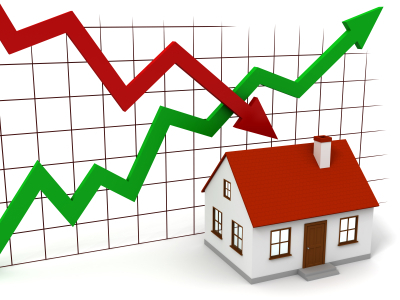 On the one hand, rising demand and a shortage of homes for sale create upward price pressure. On the other, those are offset by an expected increase in mortgage rates and fewer buyers who can afford today’s home prices (called “low affordability” by economists). Some also worry the new tax overhaul will slow home sales and sap prices. A county-by-county analysis by Moody’s Analytics shows home prices in Orange, Riverside and San Bernardino counties will be at least 3.6 percent lower than where they would have been in 2019 without the tax law. In Los Angeles County, prices will be nearly 5 percent lower previously expected growth rates. The National Association of Realtors projected the tax law will curtail California home price growth by nearly 1 percent. Southern California home sales rose 2 percent to 208,250 transactions through October 2017, according to CoreLogic. But 2018 sales likely will only rise about 1 percent in California and the region, Realtor forecasters said. Orange County sales are projected to increase 2.7 percent this year, according to Chapman. Sales forecasts were unavailable for Los Angeles, Riverside and San Bernardino counties. Sales have plateaued across the state and region, said California Association of Realtors Chief Economist Leslie Appleton-Young. Which is a bit of a mystery, given the state’s robust job growth and still-low mortgage rates in 2017. The answer to that riddle, said CAR’s Appleton-Young, is a lack of inventory and prices starting to get out of reach for some. The nation also has become less mobile, said Richard Green, director of USC’s Lusk Center for Real Estate. Interest for the benchmark, 30-year fixed-rate mortgage will average between 4.3 percent to 4.6 percent in the year ahead, according to CAR, Chapman and CoreLogic. Mortgage rates have average 3.8 percent over the past three years, with just two brief periods when rates got above 4 percent. Now, economists say, rates are heading up again, and likely will stay above 4 percent for the coming year. Federal Reserve hikes in short-term interest rates will directly impact adjustable-rate mortgages and home equity lines of credit, CoreLogic said. They also will drive up long-term rates, to which fixed mortgages are tied. Combined with higher prices, that translates to a 15 percent increase in monthly principal and interest payments for first-time homebuyers, said CoreLogic Chief Economist Frank Nothaft. With just 30,000 Southern California homes for sale, 2018 will start with the lowest for-sale inventory in five years. The lack of homes for sale that has plagued the region and the nation for the past five years will continue in the year ahead. Southern California’s for-sale listings fell to just above 30,000 in December, the lowest number since the summer of 2013, according to ReportsOnHousing.com. Why are there so few homes? People are staying put longer between sales — 11 years, twice the 2009 average, according to CAR. Homeowners also are reluctant to sell because they can’t find another home in which to move. Homeowners also stay put to avoid capital gains taxes or higher property taxes on a new home. Those who got mortgages when 30-year rates averaged 3.5 percent also are “locked in” because they don’t want to give up their lower house payments. Because of the newly passed tax legislation, homeowners with home loans greater than $750,000 will stay put to keep their mortgage interest tax deductions. “For-sale inventory will stay lean because homeowners are not going to move, (and) that’s going to limit the inventory that’s for sale,” CoreLogic’s Nothaft said. Orange County rents are projected to rise 3 percent to 3.6 percent in 2018, according to apartment data firm RealPage and the USC Casden Multifamily Forecast. Los Angeles County apartment rent will rise 3 percent, both forecasts show. Inland Empire apartment rents will rise faster: Up 4.1 percent to 4.4 percent, according to the two forecasts. Most Southern California apartments will be full. Vacancy rates in the region will be around 3.5 to 3.6 percent, according to RealPage. Low vacancy rates will keep apartment rents high, economists said. “As long as the buildings are full and the new development fills up, that’s going to allow rent growth to continue,” said Greg Willett, RealPage chief economist. Rent hikes will continue so long as vacancy rates stay at 4 percent or lower, added USC’s Green. “Most places, usually at 5 percent is when rent flattens out,” he said. When will rent go down? Yes, but only if you plan to live there awhile to ride out any potential downturns. After almost six years of home-price gains, people are asking how much longer will this trend last? Is it too late to buy a home? Southern California single-family home prices have risen $239,000 or 91 percent over the past 69 months, according to CAR. How much longer can this go on? How soon will prices start falling? Is it safe to buy a home today? Most economists say this bull market still has some legs, lasting a year or two more at least, if not five. First, economists note the last crash was preceded by a buildup of homes sitting on the market without selling. Currently, few homes stay on the market long, and as mentioned earlier, Southern California listings are at a five-year low. Demographics also could keep the housing market afloat since millennials are expected start reaching first-time homebuying ages over the next five years, CoreLogic’s Nothaft said. “We have a demographic tailwind going forward,” he said. So, is it a good time to buy a home? But there are some precautions you should take first, added USC’s Green. Contact us at 310-918-5027 or batyrealestate@gmail.com for a free home evaluation - Get Your South Bay Home Value Report Today.